Home / clothing / lists / matchbook mag / movies / "I don't like the sound of all the lists he's making." "I don't like the sound of all the lists he's making." I found these "50 things" lists on Marchbook Mag, and thought I'd be fun to see how I fair on the lists. I find the generalized lists of what you should own to be a bit limiting. There are certain things that I would just ever wear (striped pajamas? why is that necessary? ), or unpractical for my lifestyle. When it comes to footwear, I absolutely love flats. I have about 15 pairs of ballet flats. Clearly, they are my go-to shoe of choice. But loafers? Not a fan. I have a pair that I almost never wear. I just don't find they suit my style. And technically I own sneakers, but I only wear them for exercise or golf, not as a "fashion" statement (in my opinion, a trend which never should have started). But I'm surprised that Hunters aren't on the list. Who doesn't need a pair of rain boots? The accessories list is more subjective. I don't go out to fancy dinners, and don't have shawls or evening clutches for the occasion. I really do want a straw hat, though. I have no idea where I would wear it, but they are so cute! For the tops, I dislike tunics. They confuse me. Are they too long of tops, or too short of dresses? Make up your mind! And I over did (Abercrombie) polo shirts in high school, and haven't looked back. Again, the only time I wear one is to go golfing. For the outerwear, I reallllly want a navy blazer. I have red and beige, but I haven't been able to commit to a navy one yet. Probably because they don't go as cheap as the other colours. For dresses, my shirt dresses are all too large now. I've been meaning to replace them with some of the cute ones from the Gap! Movies! I love laying in bed and watching movies in the summer. Stress free, and it always comes with popcorn (or chocolate covered raisins, or potato chips). Personally, I'm a fan of the classics, hence the heavy marking on the left side of the list. I've always wanted to see National Velvet and Clueless (I can't believe I haven't), but that's it from the un-checked list. 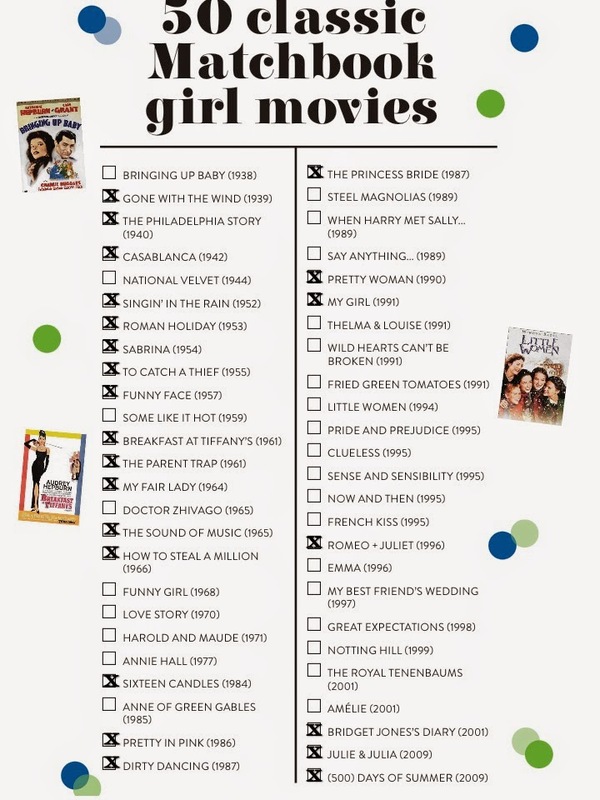 I was surprised that "A League of Their Own" wasn't on the list (such a classic), or "The Notebook". They are amazing (and very arguably "girl movies"). What do you think of the lists? 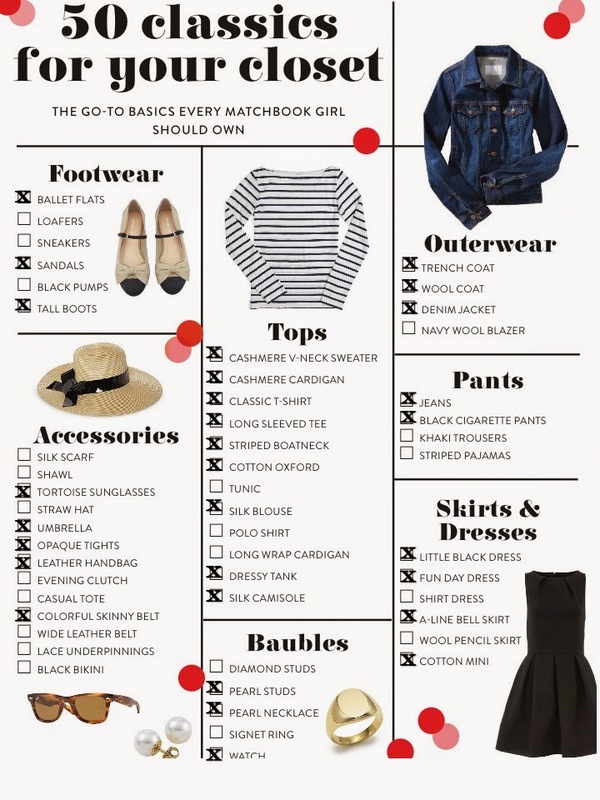 Are your favourite items of clothing on the list? Or did your favourite movie make the cut?